C. T. Vivian addressing the annual convention of the Association for the Study of African American Life and History in Atlanta, September 27, 2015. Cordy Tindell Vivian, usually known as C. T. Vivian (born July 28, 1924), is a minister, author, and was a close friend and lieutenant of Martin Luther King Jr. during the Civil Rights Movement. Vivian continues to reside in Atlanta, Georgia and most recently founded the C. T. Vivian Leadership Institute, Inc. He is a member of the Alpha Phi Alpha fraternity. C. T. Vivian is a distinguished minister, author, and organizer. A leader in the Civil Rights Movement and friend to Martin Luther King, Jr., he participated in Freedom Rides and sit-ins across our country. Vivian also helped found numerous civil rights organizations, including Vision, the National Anti-Klan Network, and the Center for Democratic Renewal. In 2012, he returned to serve as interim President of the Southern Christian Leadership Conference. Vivian was born in Boonville, Missouri. As a small boy he migrated with his mother to Macomb, Illinois, where he attended Lincoln Grade School and Edison Junior High School. Vivian graduated from Macomb High School in 1942 and went on to attend Western Illinois University in Macomb, where he worked as the sports editor for the school newspaper. His first professional job was recreation director for the Carver Community Center in Peoria, Illinois. There, Vivian participated in his first sit-in demonstrations, which successfully integrated Barton's Cafeteria in 1947. Studying for the ministry at American Baptist College in Nashville, Tennessee in 1959, Vivian met James Lawson, who was teaching Mohandas Gandhi's nonviolent direct action strategy to the Nashville Student Movement. Soon Lawson's students, including Diane Nash, Bernard Lafayette, James Bevel, John Lewis and others from American Baptist, Fisk University and Tennessee State University, organized a systematic nonviolent sit-in campaign. On April 19, 1960, 4,000 demonstrators marched on City Hall, where Vivian and Diane Nash challenged Nashville Mayor Ben West. As a result, Mayor West publicly agreed that racial discrimination was morally wrong. Many of the students who participated in the Nashville Student Movement soon took on major leadership roles in both the Student Nonviolent Coordinating Committee (SNCC) and the Southern Christian Leadership Conference (SCLC). Vivian wrote Black Power and the American Myth in 1970, a book about the failings of the Civil Rights Movement. The book was published by Fortress Press of Philadelphia, Pennsylvania. In 1961, Vivian, now a member of the Southern Christian Leadership Conference (SCLC) participated in Freedom Rides replacing injured members of the Congress of Racial Equality (CORE). 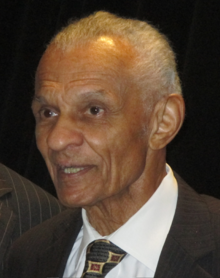 He helped found the Nashville Christian Leadership Conference, and helped organize the first sit-ins in Nashville in 1960 and the first civil rights march in 1961. Vivian rode the first "Freedom Bus" into Jackson, Mississippi, and went on to work alongside Martin Luther King Jr., James Bevel, Diane Nash, and others on SCLC's Executive Staff in Birmingham, Selma, Chicago, Nashville, the March on Washington; Danville, Virginia, and St. Augustine, Florida. Some claim that the St. Augustine campaign helped lead to the passage of the landmark Civil Rights Act of 1964, and Vivian's role in it was honored when he returned to the city in 2008 to dedicate a Freedom Trail of historic sites of the Civil Rights Movement. During the summer following the Selma Voting Rights Movement, Vivian conceived and directed an educational program, Vision, and put 702 Alabama students in college with scholarships (this program later became Upward Bound). His 1970 Black Power and the American Myth was the first book on the Civil Rights Movement by a member of Martin Luther King's staff. In the 1970s Vivian moved to Atlanta, and in 1977 founded the Black Action Strategies and Information Center (BASICS), a consultancy on multiculturalism and race relations in the workplace and other contexts. In 1979 he co-founded, with Anne Braden, the Center for Democratic Renewal (initially as the National Anti-Klan Network), an organization where blacks and whites worked together in response to white supremacist activity. In 1984 he served in Jesse Jackson's presidential campaign, as the national deputy director for clergy. In 1994 he helped to establish, and served on the board of Capitol City Bank and Trust Co., a black-owned Atlanta bank. He serves currently on the board of Every Church a Peace Church. Vivian continues to speak publicly and offer workshops, and has done so at many conferences around the country and the world, including with the United Nations. He was featured as an activist and an analyst in the civil rights documentary Eyes on the Prize, and has been featured in a PBS special, The Healing Ministry of Dr. C. T. Vivian. He has made numerous appearances on Oprah as well as the Montel Williams Show and Donahue. He is the focus of the biography Challenge and Change by Lydia Walker. In 2008, Vivian founded and incorporated the C. T. Vivian Leadership Institute, Inc. (CTVLI) to "Create a Model Leadership Culture in Atlanta" Georgia. The C. T. Vivian Leadership Institute conceived, developed and implemented the "Yes, We Care" campaign on December 18, 2008 (four days after the City of Atlanta turned the water off at Morris Brown College [MBC]) and, over a period of two and a half months, mobilized the Atlanta community to donate in excess of $500,000 directly to Morris Brown as "bridge funding." This effort literally saved this Historically Black College or University (HBCU) which was founded in 1881 and allowed the college to negotiate with the City which ultimately restored the water services to the college. Additionally, this strategic campaign gave impetus to MBC to expand and renew its donor base. Subsequent to the Morris Brown campaign, Vivian began discussions with Mosaica Educational Systems which ultimately lead to a partnership with the Atlanta Preparatory Academy (APA) an innovative charter school based in Atlanta at the historic Jordan Hall facility. ^ a b Cole, Eric. "Vivian, Cordy Tindell "C.T." (1924– )". BlackPast.org. Retrieved March 27, 2018. ^ "Civil rights veterans join Martin Luther King Jr.'s fraternity; Alpha Phi Alpha holds initiation ceremony in Atlanta". Alpha Phi Alpha. December 10, 2010. Archived from the original on February 3, 2015. Retrieved November 21, 2013. ^ DuBois, Joshua. (January 5, 2014) "Keeping Tabs on Obama’s Church Attendance Is No Way to Gauge His Faith". Politics section. The Daily Beast. retrieved 10 August 2014. ^ "President Obama Names Presidential Medal of Freedom Recipients". Office of the Press Secretary, The White House. August 8, 2013. Retrieved August 8, 2013. ^ Leonard Zeskind, "The Center for Democratic Renewal Closes its Doors", March 28, 2008. ^ "Timeline". Archived from the original on February 8, 2004. Retrieved April 20, 2017. CS1 maint: BOT: original-url status unknown (link), Peoria Journal Star, October 24, 1999. ^ Reverend C. T. Vivian, Providence Missionary Baptist Church, Atlanta, Georgia. Pam Adams, ""Changing the Nation"". Archived from the original on October 14, 2007. Retrieved September 8, 2008. CS1 maint: BOT: original-url status unknown (link) , The Legacy Project, Peoria Journal Star, October 24, 1999 - an interview, two articles, and a timeline of his life. C. T. Vivian, The Transformation of America Project. Includes five-minute video interview with Vivian. Vivian, C. T.(1924–) - Minister, civil rights activist, The Online Encyclopedia. Wikimedia Commons has media related to C. T. Vivian.